TNPSC Group IV Jobs Recruitment Exam Notification 2017: Tamil Nadu Public Service Commission TNPSC has issued notification for the recruitment of candidates Village Administrative Officer, Junior Assistant, Bill Collector, Field Surveyor, Draftsman, Typist and Steno Typist Jobs. Interested applicants have to register for specific post using One Time Registration system with the payment of Rs. 150/- towards registration fee. Application form should be submitted through online is 13-12-2017. Pay scale for all posts in TNPSC recruitment is Rs. 5,200/- to Rs. 20,200/- plus Grade Pay Rs. 2400/ 2800/-. Age limit for the all Group IV vacancies (except Village Administrative Officer: 21 - 30 years) is 18 years to 30 years. Age relaxations admissible as per Tamil Nadu Govt Rules. Selection for TNPSC Recruitment Group IV vacancies is based on written examination. Tentative date of written exam is 11-02-2017 from 10.00 AM to 01.00 PM. 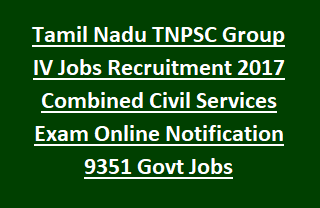 For more details of TNPSC Group IV Recruitment Village Administrative Officer, Typist, Junior Assistant vacancy details, application procedure, Examination Fee, Registration Fee details, please see the notification. Total available vacancies in TNPSC Recruitment are 9351 posts. Pay scale for Group IV Jobs is Rs. 5,200/- to Rs. 20,200/- plus Grade Pay Rs. 2400/ 2800/-. Age limit for the post Village Administrative Officer is 21 years to 30 years. For other posts minimum age limit is 18 years and maximum age limit is 30 years. Age Relaxations applicable for reserved category as per Tamil Nadu govt rules and regulations. Typist: SSLC or equivalent examination and must have passed Govt Technical Examination in Type Writing. Steno Typist: SSLC or equivalent examination and must have passed Govt Technical Examination in Type Writing and Shorthand. See the TNPSC Notification for other posts qualification details. TNPSC Group IV Recruitment selection is based on candidate skills in Objective Type Written Examination. Objective Type Written Examination will be conducted for 300 marks. Minimum qualifying marks are 90 marks. Time Duration is 3 hours. Questions will be set based on SSLC Standards. Examination fee for SC/ ST/ Pwd/ MBC/ Ex Servicemen is nil. See the notification for application fee payment procedure. Applicants having all eligible criteria should apply for Group IV Jobs using the Commission’s Website www.tnpsc.gov.in. Before applying for the post candidate must register for One Time Registration OTR. Upload the application with specific documents, Signature copy and Photograph before 13-12-2017.